“Erected to God and Dedicated to Holy Sts. John” is a phrase familiar to all masons. 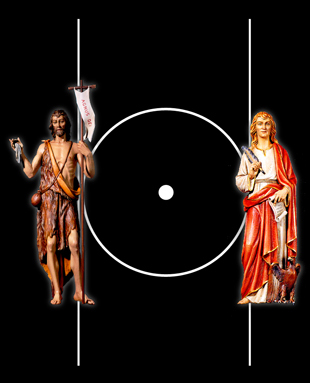 It being the first dictation I heard, I wondered on what is the symbolism of these two saints, St. John the Baptist and St. John the Evangelist in masonry except that they are patron saints of masons according to my Lecturer. But my curiosity deepened when noticed that there are non-christian masons who accepted the phrase as dictated although they did not know these saints. However, I learned that Freemasonry practices universality of religion, so what is the significance of these two personages. The Gospel of Luke (Luke 1:36, 56–57) states that John was born about six months before Jesus; therefore, the feast of John the Baptist was fixed on 24 June, six months before Christmas Eve. The feast day of June 24 is celebrated by Christians with water being used in ceremony. The festival in Cancer , a water sign in the summer solstice when the path of the Sun in the sky is farthest north in the Northern Hemisphere which has longest day but shorter night. While the feast of St John the Evangelist or Apostle John , the disciple of Jesus is celebrated on December 27 a few days after the sun in Capricorn. Apostle John was a historical figure, one of the pillars of the Jerusalem church after Jesus’ death. He was one of Christ’s original twelve apostles and is thought to be the only one to have lived into old age. 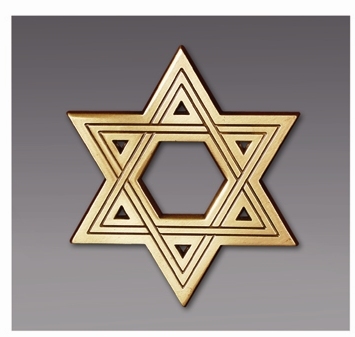 From the interlocked star of Solomon or the hexagram which is also represented by the square and compass, St John the Baptist represented the inverted pyramid pointing downward, the alchemical sign water, symbolizes emotional love ruled by the moon. St. John the Evangelist, represented as the pyramid pointing up symbolizing fire that is the drive and will of action. When placed together, they symbolize the perfect balance of darkness and light, life and death, passion and constraint, will and emotion, summer and winter, Cancer and Capricorn. lines. These tangents are said to represent the two St. Johns. What makes this symbolism complete is the fact that the circle represents the annual cycle of the sun thru the zodiac, the point being the sun and the circle being the zodiac. In addition, the age old astronomical sign for the sun is such circle with a center point. The two parallel lines are tangents of the circle at the solstitial points of cancer and capricorn. They represent limit points beyond which the sun can never pass in its journey thru the ecliptic plane, in its ascent and descent. Because these two tangent points are symbols for the two solstices, and respectively, these two gates are symbols for the two St. Johns. “The galaxy, Macrobius says, crosses the zodiac in two opposite points, cancer and capricorn, the tropical points in the sun’s course called the Gates of the Sun. The milky way crossed at the signs of cancer and capricorn.” This quotation refers to the symbolism referred to as the masonic symbol of the sun and the two tangent lines. The points of the tangent lines are the two Gates of the Sun, in the macrocosmic sense. In our Western tradition, The Greeks described the “descent into generation” into re-birth, by the tropical gate of Cancer and the “ascent to god” of the soul after death, by the tropical gate of Capricorn, in which the soul ascends into the spiritual ether of the planetary spheres. Also, the traditional symbolism of the gate of god to the north in Capricorn and the gate of men to the south in Cancer represents the actual physical astronomy of our annual ascending and descending phases of the tropical zodiac as symbolized by the winter and summer solstices. Traditionally, the Gate of Man was that zodiacal house where the soul, before birth and intended for incarnation on earth, would descend into the moon sphere waiting for re-birth. The Gate of the Sun was that zodiacal house wherein the human soul, after death, would ascend into the planetary spheres beyond the moon sphere, for its sojourn thru the spiritual worlds, to meet God. After a lifetime on earth, the human soul exits thru the gate of the sun in Capricorn and tobegin its journey after death. After its return from the celestial spheres, the human soul will then reenter the earth sphere for re-birth thru the gate of man in the sign of Cancer. Thereafter, the second half of the souls journey began wherein the soul descended thru the same spheres again on its downward path into incarnation on earth and passing thru the Gate of Man to enter the moon sphere to await rebirth with millions of other souls. While during the first half of the journey, the soul reflected upon and suffered for the sins of its past life, during the second half, the soul takes in those forces necessary to build up his future astral, etheric and physical bodies. These forces include both preparing its future karma and learning the wisdom taught by the spirits residing in the different planetary spheres.